The home automation space just got a little more crowded. Electronics retailer Best Buy is entering the crowded home automation market through a deal with startup Smart Home Ventures, which designed its offering around ease of use. Called Peq (pronounced “peak”), the service costs $9.99 a month for an unlimited number of gadgets connected to a wireless hub, which are sold in kits ranging in cost from about $120 to $490. Best Buy will start selling the products at 250 stores at the end of the month. Peq will also be available online and through a telecom company that is yet to be announced, according to a company representative. As with most smart home offerings, the makers of Peq assume the primary draw for consumers is home security. Over time, the company expects consumers to add other connected devices, such as lamp modules and thermostats. The monthly service charge covers the ability to watch live video on a smartphone and record twenty video clips and 40 images a day. It also sends text or email alerts in response to certain occurrences, such as when a door or window sensor is tripped at an unexpected time. Given the growing number of smart home kits on store shelves, how does Peq distinguish itself? Too many smart home companies are essentially hardware vendors, but there’s room for a company focused on the average consumer, rather than the early technology adopter, according to Kansas City-based Smart Home Ventures CEO Ted Schremp. “The hardest part is the human component. The technology is quite simple or it can be complex, but it absolutely exists. It’s really about making the average consumer take advantage of it,” he said. The company also offers round-the-clock support. Once users have their camera, door and window sensors, and other gadgets connected to the ZigBee hub, there’s a smartphone or tablet app that can be used to program the devices. The Peq software has a rules engine to set up schedules, such as turning the thermostat down at night, as well as to monitor the home as needed. For instance, a user can set up the system to record video at 3:00 in the afternoon for fifteen minutes to make sure a child has let herself in the house after arriving home from school. The hardware itself, which is made by other vendors, complies with the iControl’s OpenHome specification used in products offered by ADT, Comcast and Time Warner Cable. 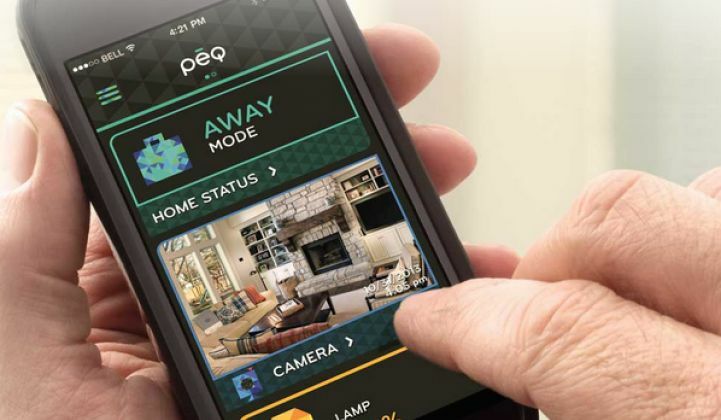 With this launch, the Peq offering is focused on home security, but the company thinks that saving money on energy is high on the list of consumers’ priorities. “A service like Peq is an easy way to get people comfortable with the smart home and get used to the broader energy management notion as they experience home automation on a daily basis,” said Steven Bosch, the company's vice president of product and strategy. Smart Home Ventures envisions offering demand response or efficiency services through partnerships with companies such as EcoFactor. Its sensors can measure temperature, and the rules engine is simple enough to program interactions between devices, Bosch said. For instance, a consumer could optimize cooling by controlling both a home’s vents and the thermostat based on a temperature reading. Analysts say sales of smart home gear are finally starting to grow with the arrival of better technology and retail sales in stores, such as Staples and Lowe's. Park Associates found that nearly 4 percent of U.S. households will have a smart home controller by the end of 2014, and predicts it will increase to nearly 6 percent next year. More than one-third of the smart thermostats, though, were standalone. That means that utilities should keep an eye on home automation as a potentially important channel for delivering energy-related services. But consumers that are most interested in energy will likely start with a thermostat from the likes of Nest or Honeywell over a full-blown home automation system. Five home energy management system vendors have announced sales that have surpassed 1 million customers, while Nest was set to pass the million-home mark early this year, according to GTM analyst Kamil Bojanczyk. As for Peq, its biggest innovation isn’t so much the hardware, but its software and business model of charging a monthly fee for user-controlled home security and an unlimited number of devices. Whether that’s enough to break out from the crowd depends on how user-friendly the company can make the product.